#GreaterAs1Harrisonburg and #GreaterAs1 are the hashtags to use. We want to show the world that Harrisonburg welcomes refugees. We want to join in larger national conversations and show that we are united in our opposition to President Trump's Executive Order. We want to show President Trump that he is out touch with the realities of refugees, refugee allies, and resettlement communities. If you live in other communities and want to help, feel free to add your city to the hashtag instead of Harrisonburg, i.e., #GreaterAs1Staunton, #GreaterAs1Woodstock, etc. Please be sure to also use the broad #GreaterAs1 hashtag as well, as it signifies our alliance and unity with folks working around the country. Post messages, pictures and videos on social media using the hastags #GreaterAs1Harrisonburg and #GreaterAs1. If you are okay with us or CWS Harrisonburg Refugee Resettlement using the content you create for other advocacy projects (including but not limited to videos, photo installations, and lobbying materials) please submit your work to us. The Executive Order states that only localities that want to resettle refugees will have to accept them. Post and hashtag messages showing support for refugees to resettle here. We can use these messages to show our elected officials that we have support here in Harrisonburg for refugee resettlement. Keep tweeting POTUS and the White House and post comments on the White House FB posts! Call your elected officials. Don't stop, friends. Don't stop. Any suspension will cause families to be separated INDEFINITELY. (During the suspension, a refugee's security or medical clearances will expire, causing them to be re-requested and delayed for months or YEARS.) Further, there are refugees in IOM Transit Centers and other camps that are waiting for their flights. With the suspension occurs, such refugees will be sent back to the camps. All will have already given up their shelters and whatever meager belongings they had. We cannot allow this to happen. 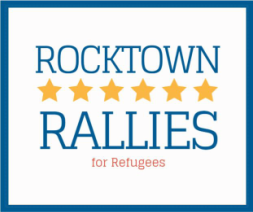 Follow Rocktown Rallies and CWS Harrisonburg Refugee Resettlement on Facebook for more calls to action.